At the end of my busy day of working, I stopped at Whole Foods® to grab something to eat. I was very hungry and needed sustenance immediately, but also felt like I deserved a sweet treat for the hard day I’d had. I limited myself to one desert item, but couldn’t decide what to get at the bakery. So I went to the grocery section to the packaged baked goods. There I saw this little plain brownie surrounded by all of those fancy, high-end chocolates, candies, and cookies. I cannot tell a lie, I bypassed the brownie so many times because it looked boring; but my eye kept travelling back to it. “It’s so plain,” I kept thinking. I was so fixated on this plain little brownie, so I bought it — what could it hurt. “I’ll try it, and if I don’t like it I won’t buy it again,” is what I thought. Yeah, well. The brownie came from Greyston Bakery® located in Yonkers, NY — and Greyston is baking the most unassuming brownies imaginable. Why unassuming? Because the brownies looked so plain in a simple package; and when looking at them in the store I didn’t think they would be that impactful (to be dramatic). I was wrong. I fell in love at the first bite. That plain chocolate brownie was the most delicious, fudgy goodness I had ever tasted in a packaged baked good. I couldn’t believe it was a packaged, store-bought brownie. I just bought it as a little sweet treat for myself, but I wanted more. As a brownie connoisseur, I am very, very judgmental about brownies. One of my all-time favorite brownies is the Maysville brownie from Busken® Bakery in Cincinnati, OH. Its fudgy-goodness cake is topped with thick fudge, but it’s not that stiff fudge, it’s soft and almost sort of melty. And it’s topped with nuts. My heart melts for that brownie. The Busken Maysville brownie is dressed up more than the Greyston brownie, but the Busken brownie is not a store-packaged item — you can only buy it from the bakery. So the fact that Greyston can churn out a great-tasting brownie as a store-packaged item just gives the company more props; because that brownie has a lot of flavor! So I went and bought another one — okay…three…I bought three more. Because I liked the brownies so much, I wanted to know more about its origin. From the homepage, the first link I saw read, “The Bakery & Open Hiring™.” What is “Open Hiring”? I clicked on the link and I see a quote from the company’s bakery trainer, Dion Drew. The quote said, “Life is what you make it, but Greyston helps you achieve what you want in life.” What? Why is a bakery trainer saying such profound words about baking…is baking really that mystical? I hadn’t even looked through the entire website and I already had too many questions. I was intrigued. It turns out that the Greyston trademarked open hire process is not a gimmick, but it’s the company’s business model. The collaborative approach business model means the company fills jobs without asking questions to help alleviate generations of poverty and unemployment. 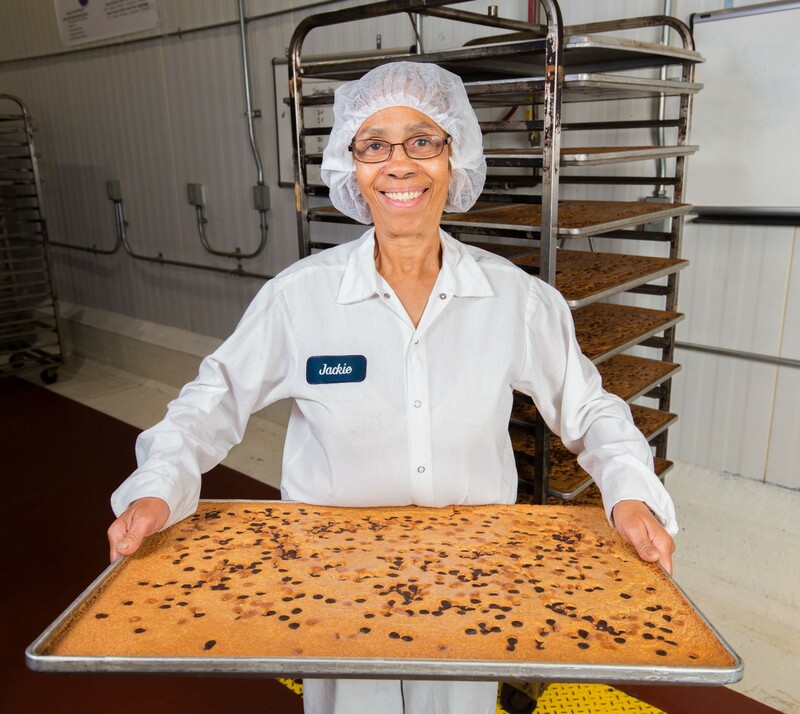 Through its open hire business model the company not only hires without question, but during “the apprenticeship period…employees learn baking and employment readiness skills.” So even if an employee decides to leave the company, she/he has a set of transferable skills to move forward in her/his life. Increased self-esteem, self-confidence, and ambition all come to mind when thinking about what that little brownie I happened to come across provides people. The company is working toward sustainability efforts for people right here in the United States. I’m a fan! And Greyston not only concentrates on its employees, the company’s customer service is fantastic too. I emailed the company about some brownies, and the company representative was so gracious I felt completely comfortable relaying what I wanted to say. She spoke to me versus at me, like a friend would do. At times I forgot I was speaking to a stranger. I have had negative interactions with businesses, and whether it is in person, via phone or email, I’ve encountered that sense of hostility from their representatives. There have been countless occasions where a toxic interaction with a defensive and rude customer service representative caused me to feel horrible, even when asking a simple question about the product. Good customer service is the heart of any business and can make or break a company. Regardless of if a business is going through a rough patch needing to reorganize, if its customer service is up to par, the customers will stick around. Happy employees make happy customers; that’s my philosophy. From my experience with Greyston Bakery, I can tell the company has taken giving to a whole new level. Its mission and company culture translates into its employees, products, and customer experience. The company gives to its employees, and the employees are paying it forward to the customers and the community. *DISCLAIMER: This article is not endorsed by Greyston Bakery. The opinions, views, and reviews based in this article solely belong to the author and do not reflect the opinions, views, or reviews of Greyston Bakery.